Remember that last July we were encouraging you to join the fight for the Net Neutrality to guarantee fair competition over the internet in the United States? As of Thursday, 14th of December, this fight is still ongoing the FCC is meeting to vote for either the suspension or the conservation of the Net Neutrality principle. Unfortunately, as it appears, the majority of people should vote for its suspension. “Network Neutrality” or “Net Neutrality” was a principle invented in 2003 by American judge, Tim Wu. One of the key elements of the Internet architecture is that user data is sent through the internet in the form of standardised packets not distinguished according to their senders, receivers, or nature. This concept of non-discrimination allows data to move across networks without being blocked, degraded or favoured by telecommunication carriers. What would be the consequences of the end of Net Neutrality? Without Net Neutrality, the Internet could become much more expensive for the end user as well as for companies. Indeed telecommunication carriers consider that certain services like video streaming use more packets and so require more bandwidth (like Netflix or YouTube). Hence big players could pay up for fast-lane privileges, privileges that smaller companies could not afford. Industries like Internet of Things, the self-driving cars or healthcare could suffer a lot from the end of Net Neutrality. 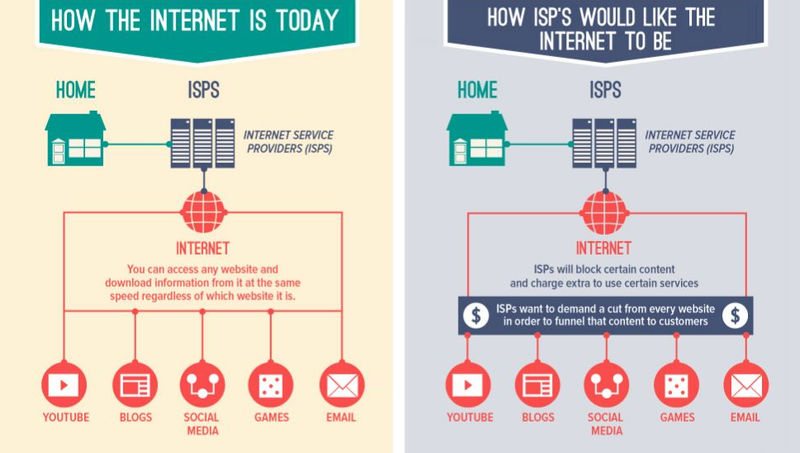 The risk is that the Internet becomes a two-tier service with consumers who cannot afford a higher pricing and so who will access slower to the network. Consumers will be forced to choose based on the speed and the access price to one website instead of their real “internet needs”. Carriers might start to create “basket of services“ which will lead to competitive problems. For instance, consumers could be asked to pay a $5 supplement for unlimited access to Facebook-Instagram-Snapchat for example, and $5 more for unlimited access to YouTube and Netflix… However, what about the companies that are not included in these special offers? What can we do to save the Net Neutrality? If you want to join the fight for the Net Neutrality, you can sign the online protest to stop the FCC by clicking here.